We provide solutions to issues of all kinds in order to appropriately manage owned buildings. 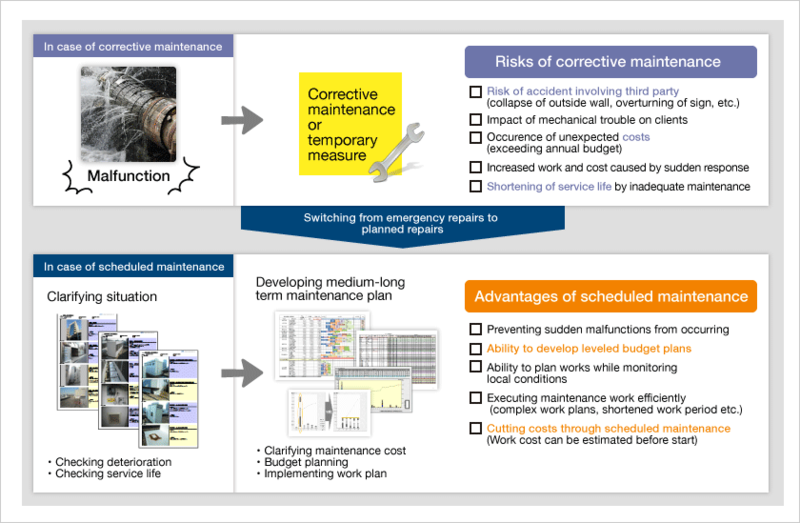 By precisely clarifying the state of multiple owned buildings, we can lower medium and long term costs, optimize maintenance plans, and identify future risks (preventing third party damage). 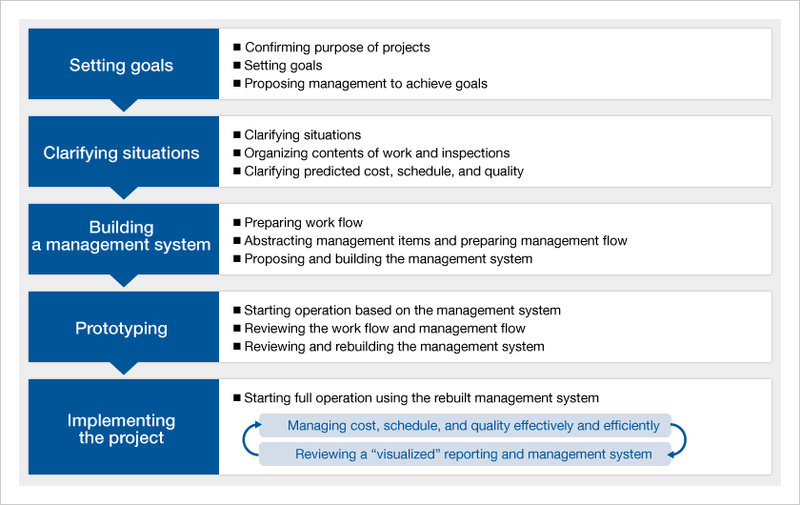 We develop methods for the owned building management process based on the PDCA cycle to optimize processes. We deal with all phenomena related to owned buildings: overall planning, handling individual works, and preparing a database. We can undertake individual works including new construction, repairs, upgrading, and layout modification works. We support all types of work related to owned buildings, overall planning, handling individual works, and building a database. If a company owns multiple buildings, it must occasionally carry out many simultaneous works and inspections in parallel, requiring complex management. Meiho offers clients in this situation its various "services fully applying the Multi-Base Work Management System": effective and efficient management of cost, schedule, quality etc. Meiho's Multi-Base Work Management System services are not rigidly uniform. We organize work and inspection items that must be managed as requested by each client, and propose an effective and efficient management method. Managing renovation of sales counters Nationwide Approx. 4,300 facilities We built a proprietary system that shares information such as changes of overall and separate costs, state of progress, execution quality etc. of the renovation work in the cloud, so the client, contractor, and Meiho accurately clarify the cost, schedule, and quality. Managing the inspection of the state of deterioration of outdoor signboards Nationwide Approx. 490 facilities We established integrated management method of remotely controlling the schedule and quality of field inspections and judgments of degree of risk. Managing the renovation of a financial institution's branches and ATMs Nationwide Approx. 980 facilities We established management of a method of clarifying the inspections and contents of work needed to renovate ATMs, verifying the costs, and remotely managing the progress of the work. Managing renovation of office buildings Nationwide 70 bases We built a database of cost, schedule, quality etc. to perform integrated management encompassing abstracting renovation items, calculating approximate work costs, developing medium and long-term repair plans, calculating annual budgets, selecting design and construction contractors, and managing the design and execution work based on field inspections. ©Meiho Facility Works Ltd. All rights reserved.